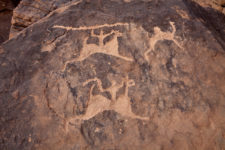 The region around the modern city of Najran, in southwest Saudi Arabia, has much to offer in terms of rock art research. 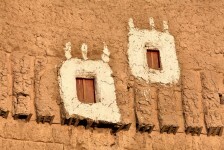 The settlement of Najran was an important center along the Incense Route. Caravans originating at the source in Yemen passed through Najran before turning northward. The western branch was destined for Egypt, the Levant, Greece and Rome, while the eastern branch headed for Mesopotamia. The peak of the incense trade was between 800 BCE-600 CE. 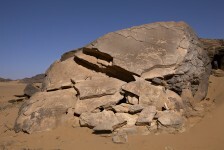 The ancient citadel of al Okhdood, located at the southwestern edge of the modern city of Najran, was constructed in the 7th-6th century BCE. 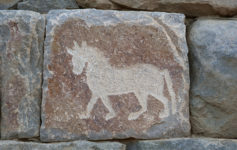 A depiction of a heavily built horse similar in form to the Nisean breed of the 6th century BCE used by Persians, and a serpeant are etched into one of the large building blocks along the avenue entering the citadel. 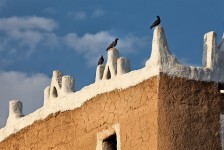 Bi’r Hima, historically known for its famous wells, is located about 30 km northeast of Najran. 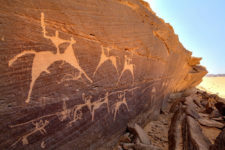 The labyrinth of wadis and jebels is home to hundreds of examples of petroglyphs, including some large, complex panels compiled of images from multiple periods. Battle scenes with cavalrymen and infantrymen wielding various weapons are most prevalent. Ostriches, domestic cattle, camels, and date palms are also common. 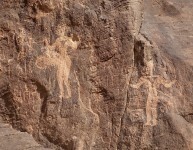 Oversized human figures are known at some localities in the Bi’r Hima/Najran region, as well as numerous “Alliah or Al-Lat goddesses” shown adjacent to battle scenes. One of the sites west of the ancient wells of Bi’r Hima was so densely illustrated that a member of Harry St. John Philby’s 1952 expedition was able to copy 250 images without moving from his position. 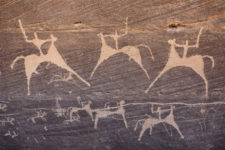 The oldest images at Bir Hima consist of large domestic cattle, some of which are decorated with stripes and other geometric designs. The breed depicted is very similar to that shown in Egyptian art, with medium to long lyre-shaped horns that point upward, and a small hump at the shoulders. Images of domestic fat-tailed sheep can be found in this area, although they are not very common. 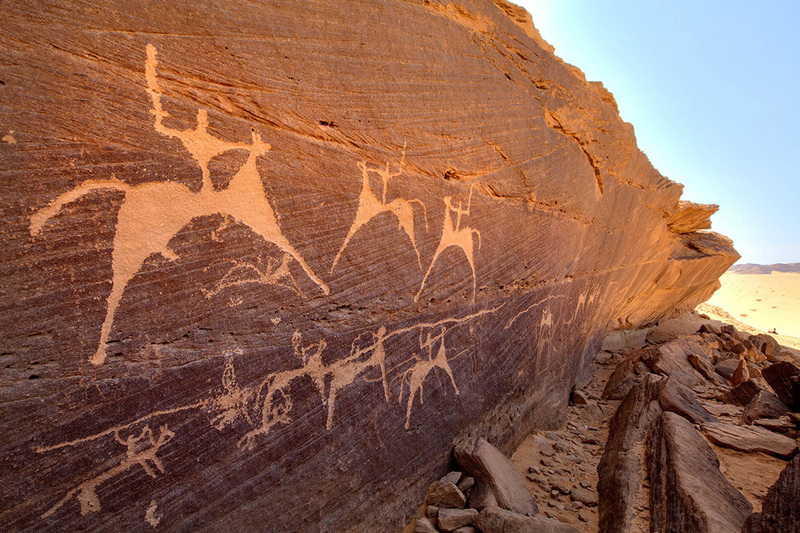 The ostriches in the Bi’r Hima rock art are the most lifelike of all those known in Saudi Arabia, with fluffy plumage and realistic postures. These appear to be about as old as the cattle, neither of which is closely associated with contemporaneous writing. 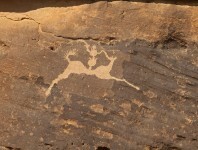 Camels are frequently shown, some with a patina indicating that they are relatively old, perhaps similar to the cattle in age, and others that look much more recent. 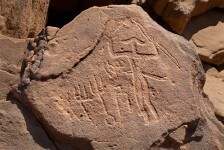 At Aa’bar Harema, a camel in a late battle scene is shown with a saddle with stirrups or tassels. 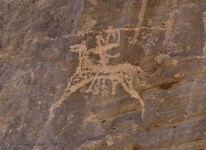 The hundreds, if not thousands of petroglyphs in the region are dominated by images of mounted cavalrymen on horses that are highly stylized, but could be of the Arabian breed. The cavalrymen are armed with long lances, swords, saifs (scimitars) and khanjars (curved knives), worn at the waist. Some are also fitted with what appear to be helmets and cuirasses. Dots around the bodies of a few horses may represent equine armour, as well. Camel corpsmen and infantrymen are also shown wielding weapons. 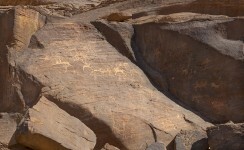 In addition to complex battle scenes, there are hundreds of examples of female images, known locally as Al-Lat goddesses, after the most important pre-Islamic goddess, although there is no proof of a connection. These are normally closely associated with cavalry and infantrymen, but also clearly appear to have served a function in fertility rites. The women are shown facing forward with braids down over their faces and their arms raised in the air, bent at the elbow.